Welcome to Tea Cup Tuesday, where Martha and I dig into our china cupboards and bring out one of our china cups to share with you all. love coming to see your beautiful china tea cups. My cup today is a little dramatic, so I have photographed it that way. This is such a lovely cup for an evening tea. I find this cup interesting. To me, this cup's decoration has an Asian style to it. Maybe even Chinese looking....do you think? But it was created in England, and as you will see in a photo below, there is an English castle in the lower right of the bottom of the cup. It is a beautiful peachy pink color with plenty of gorgeous gold filigree. also simply ringed with gold. The handle too is very simple, with just a line of gold to adorn it. You can see the interesting painting on the inside bottom of the cup better in this photo. Some of the flowers do not look like any in nature I have ever seen. Very fanciful! A.B. Jones and Sons at Grafton Works was the company that produced this cup. They resided in Longton, Stoke On Trent, in England, where most English pottery was made. This backstamp was used beginning in 1957. 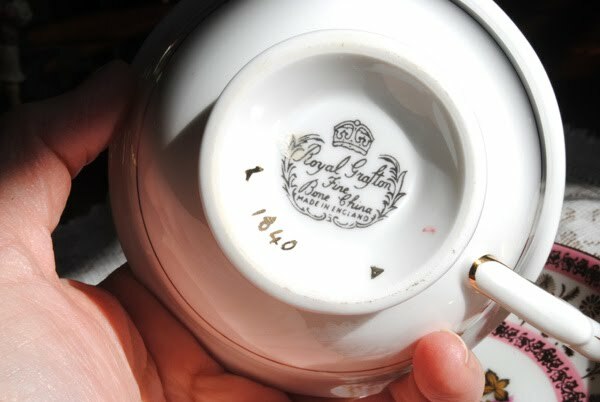 Before 1949 the "Royal" was not used, so you may have a cup that has a backstamp with just the name Grafton, or a backstamp with A. B. Jones on it. There were a number of variations of backstamps during the years they were in business 1900-1972. Thank you so much for coming by to visit today! 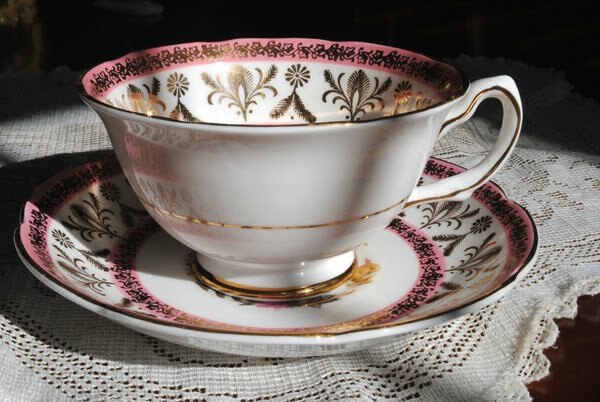 If you would like to play along, create a post with a tea cup of yours and then come back to this site or Martha's and sign up with Mr. Linky below the post. Tell us about your cup, show us the backstamp. We love seeing backstamps that we have never seen before. We love seeing all the many different tea cups that are out there. Many of you have shown us some absolutely gorgeous cups! Tell us what you love about your cup, how you came to have it, and if you know about the company who made it, share that with us too. We find all of this very interesting. That is a beautiful teacup. Love the colors and the castle in it. That is a really unique design on that tea cup! Cheerful! That is one handsome teacup; love the colours! It's very pretty with the florals inside and the little castle is a sweet surprise! Thank you for sharing it with us today and have a wonderful week. This is such a unique teacup!!! LOVE IT! I have never seen one like it EVER! As usual your tea cup is awesome. The simple outside hides the wealth of color and fun on the inside. This cup is just beautiful and so unique! A great one to have in your collection! Your teacup is so beautiful Terri. I love the beautiful florals and castle in the bottom. What a sweet surprise! Thanks for your lovely post today, quite a unique cup and wonderful details about the company also. I recently sold one of these 'inside out' type cups. I KNEW that was Royal Grafton...a favorite of mine. Just lovely! very pretty, it does look a bit Asian but the uniqueness is quite stunning I love the colors! thanks for sharing it! A beautiful cup Terri, lovely colours and gorgeous gold decoration. Love your photographs with the shadows. Good to see the sun is shining for you. No Teacup Tuesday from me this week, I didn't manage to unpack any more of my china in time for a post! Thank you so much for sharing those beautiful teacup, I love the design inside the cup and YES I see the castle picture on it, gorgeous!! love how you took the picture of it, so dramatic and beautiful! Thanks for hosting the tea party. Blessings, Susan. Pancake Tuesday & some shamrock belleek for fun @ FHC :) welcome! Dear Terri, that is one beautiful teacup! unique design and love the colours! never see one with that design actually! thanks for sharing and have a great week! What a lovely, rich teacup. The colours are wonderful. Oh the combination of pink and gold is stunning! Thank you for sharing. Terri, Your cup is unique and really beautiful. this is SO unique, Terri. 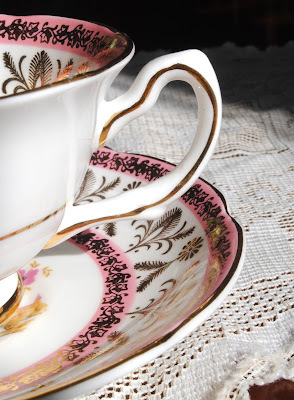 I think there are as many different teacup patterns as there are people who collect them! you shared a very interesting designed tea cup. The flowers inside look really as if they have an oriental touch. Very nice design. Thank you for hosting this nice event. Imagine the surprise as one slowly sips the tea in that precious cup and with each sip, that beautiful pattern is revealed inside the cup!! Very, lovely cup, Terri...I like the way you photographed it. The design is very nice, and the colors are, you are right, very dramatic, as they play so perfectly against each other; then the gold comes in and creates an elegant effect. Hi...that is such a pretty cup. I love the simpleness of the outside! Dramatic is just the right word for this gorgeous cup! Love the details on this one. 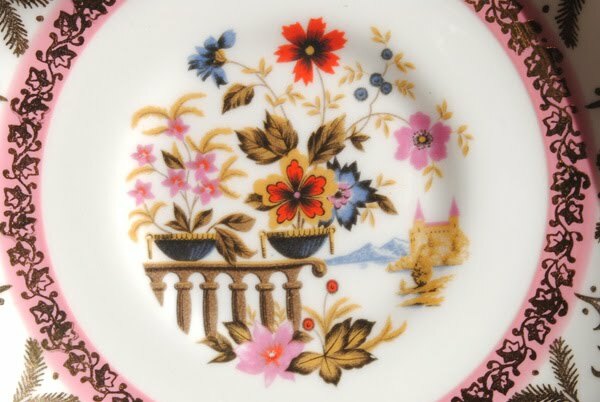 And thanks for the comments on my Limoges today! such a beautiful teacop! amazing every week a new one... I love your blog! 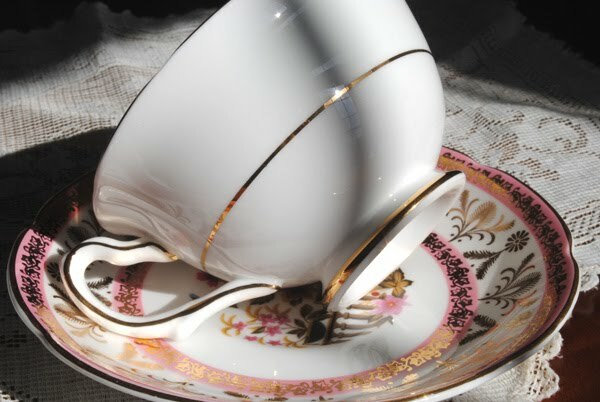 I think is one of the most beautiful Tea cups I have ever seen! Such a beautiful teacup. I love the bits of gold and the lovely design. So beautiful! The details are just breathtaking! Thank you so much for hosting this lovely tea party. I love seeing all of your beautiful teacups and saucers-this one is quite lovely! Yay...So so pretty...i adore this one Terri..very unique and has it's own charm!! Thanks for another beautiful tea time..yay...you are awesome...hugs! Wishing I could have a spot of tea with you my shining friend! This Royal Grafton teacup looks very much like the Royal Grafton I had in my teacup post last week, and I love yours. Yes, it does look Asian. The colors are so pretty,and the scene inside the cup is interesting. Thank-you for hosting another Teacup Tuesday. I find this cup truly gorgeous...like most of the others you´ve shown here!!! Thank you for hosting the Teacup Tuesday. I am visiting today (Saturday) to wish you a day filled with joy, love, and sweetness. Happy Birthday dear friend......today I celebrate YOU!! I loved your books they are so beautiful and unique! What a wonderful way to affirm positive thoughts and feelings, I may try to do this one. I also loved the tea cup very delicate thank you for sharing. 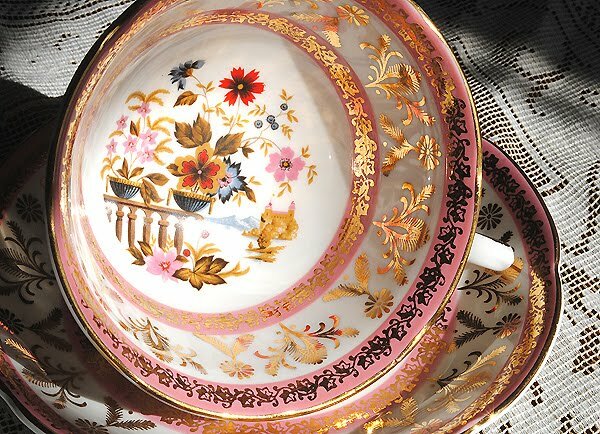 I have this Royal Grafton teacup as well, except mine has bands of dark green with gold designs. The image inside and in the middle of the saucer is identical. Beautiful!